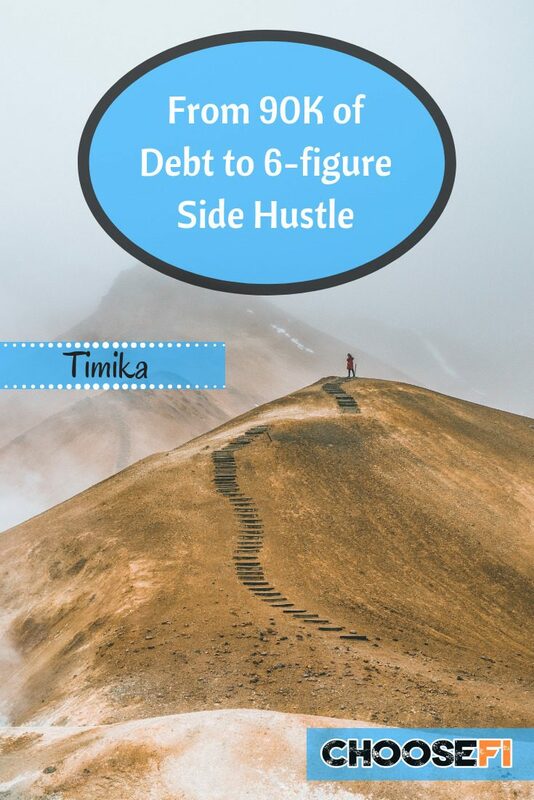 Blogger and podcaster Tamika Downes reveals how she went from $94K of debt to owning a six-figure income-earning side hustle while continuing her job as a school nurse and raising three children. Timika’s early financial experiences came through immigrant parents, from Barbados, hustling and saving. Having a side hustle was common place in Timika’s family. Despite her family’s habit of saving, Timika finished her education with $94K of debt. After her undergraduate Timika had $24K in debt. Choosing to pursue something that you’re not quite ready for can often lead someone to pay more than necessary. Nursing degrees don’t have to cost $30K; immediately after high school students can become qualified Certified Nursing Assistants (CNAs) working in hospitals or nursing homes while starting at a community college and finishing through a bridge program at a 4-year school. Nursing is a trade; find the most efficient way to get qualified. Many universities offer tuition assistant to the children of faculty/staff, often including tuition at other universities. What options did Timika consider in order to decrease her student loan debt? Timika’s mindset changed when she started to own her life circumstances; taking responsibility for her finances was a natural result. Instead of buying a $20K car, Timika bought a $20K business – a lice clinic. Timika spoke with out-of-state clinic owners and did her homework before deciding to invest in the set up for her clinic. Timika went to coding bootcamp, for 75% discount as a female minority. The lice clinic is now almost passive income: Timika only devotes three hours a week and has hired employees who manage the rest. Lots of great information in this one. “Paying off the debt gave me bandwith; finding FI gave me the ability to build my dream rather than the American Dream”. I wonder if you have to be a nurse to run a lice clinic? Great episode, Jonathan, Brad, and Timika! Obviously the takeaway isn’t that you should open up a lice clinic – though perhaps for a small handful in the audience . . . Anyway, it’s all about seeing the common threads in the podcast’s guests and taking away those that can apply to your own FI journey. Timika’s willingness to tackle new tasks and learn new skills, even when she didn’t have much of a background in them, is inspiring! totally agree Sean, Thanks for the feedback! Excellent interview. One question: when Tamika mentioning learning code, and the general agreement of how beneficial this was, can I ask exactly how learning code can benefit business owners, online entrepreneurs etc? I hear a lot of people mention it, and not being being from this background I’m interested, practically-speaking, in what learning code can do for me and where it can lead. I’m thinking about Treehouse. Any advice on this subject welcome. This was so inspirational!! And motivating me to keep pressing forward. I love this! So many times when people talk about “buying a business,” what they’re really buying is a job. It’s impressive that Timika has found a way to make it work without requiring her daily presence to supervise/babysit the employees.